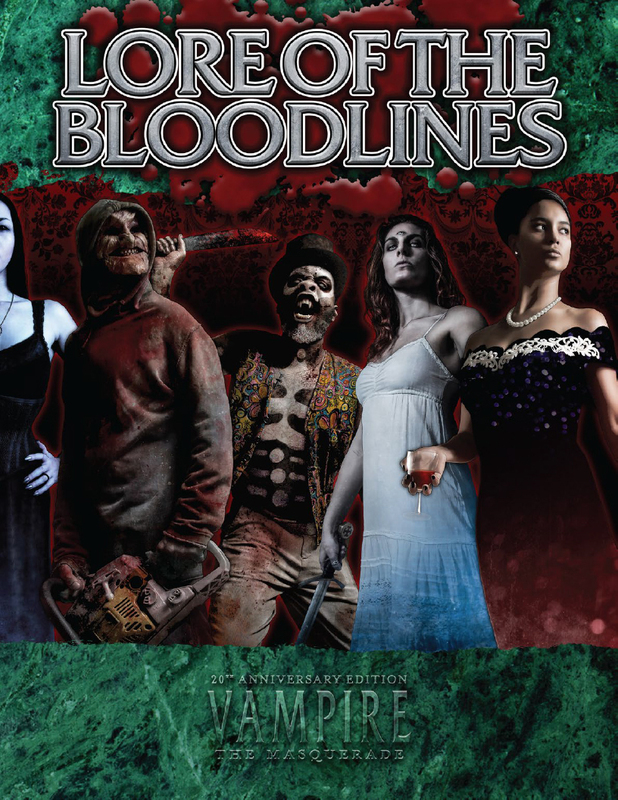 Earlier this week I was happy to learn that V20 Lore of the Bloodlines, a supplement for Vampire the Masquerade V20 went on general release Wednesday. It is no exaggeration to say that I was watching that site all day until it became available to buy. The physical copy is currently being produced, but I got the PDF yesterday and was able to read through the whole thing and am now am in a position to do a product review. This post will contain an affiliate links to Lore of the Bloodlines. Lore of the Bloodlines is a sourcebook for the extremely popular Vampire the Masquerade Roleplay game, which is part of the larger World of Darkness Universe. Currently, the 20th Anniversary Edition line of Vampire the Masquerade products are produced by Onyx Path Publishing. Vampire the Masquerade is steeped in detail and lore, with dozens of sourcebooks building a dark and seductive world. Lore of the Bloodlines is one such book, dealing with one of the more fun aspects of the game: Rare Bloodlines. To play the game, each player takes the role of a Vampire in the world. There are 13 main clans to choose from all of which are exciting and interesting, however, sometimes you want a bit more exotic. And sometimes you want exotic as an adversary. Lore of the Bloodlines provides this. Not acknowledged as clans, often cast as outsiders, Lore of the Bloodlines adds something a bit different to your vampire games. The Baali – Infernalist vampires that spend their time researching, tomb raiding and summoning demons. The Daughters of Cacophony – A (failed) experiment mingling bloodlines to create a weapon to infiltrate various other clans; their power derived from the song that is constantly in their heads and on their lips. Gargoyles – Monstrous creations of the usurper Tremere clan in the earliest nights of their existence. Bred for service, scouting and war. The Harbingers of Skulls – A bloodline of Necromancers that have traveled the lands of the dead, been baptised in the river Styx and returned with sinister purpose. Kiasyd – the results of dark experiments to create a perfect being, ruthless scholars with a touch of the fae about them. Nagaraja – Flesh Eating necromancers, descendants of those that Guard Enoch. Samedi – Carribean Vampires descended from the Baron, Loa of the Crossroads. True Brujah – Betrayed by their brethren, they step aside from the vampiric jyhad, hoarding their reasons as close as they hoard their knowledge. Just a bit of flavour there for you, based on my impressions reading each section. So, it seems logical to explain how the book flows. Each bloodline has its own section, starting with a bit of story giving you a feel for the bloodline you are about to read. I particularly liked the stories introducing Baali, Kiasyd and True Brujah stories though all were good. That being said, the writing quality was a bit hit or miss. However, I have found people forgive poorer quality writing if the story is to their liking and I enjoyed them. That being said, I compared with a friend of mine and they were utterly unimpressed as they felt that the Baali were not sinister enough, and the Tremere/Gargoyle relationship had been unnecessarily softened. I can’t comment on the Baali, as I have never read their clanbooks, though I could see where he was coming from regards the Gargoyles. What follows is a description to the reader, where the reader assumes the role of a recently embraced member of the bloodline. The description of the clan history comes from one or more scholars or elders of the bloodline and outlines theories of origin, where things went wrong (if it did) and what is happening with the bloodline in modern nights. It then presents a number of character concepts, some merits and flaws that players can use when playing these bloodlines as well as combination and high level powers available. And then it is on to the next bloodline. So, let us look at various points about Lore of the Bloodlines. You can decide if they are good or bad. It has a lot of information that is quite hard to come by (I believe it was out there in dozens of other books, but it is nicely packaged here). There is plenty of story to get your teeth into with any of the bloodlines. Every bloodline, without fail (if I recall) presents its history with an air of uncertainty (This is how my sire taught me…I am not sure if it is true). I was initially a bit meh about that, then I realised it allows me to decide what is true for my games, and prevents players “Knowing” everything. My friend who read it felt it was a bit of a cop out. There is some good artwork for every bloodline. Some of the best is conglomerated on the cover. The price is very reasonable, the most expensive version (premium hardback with PDF) was just over $30. There were other, cheaper options that were just as good. Each bloodline got about 10 pages. This is less than the 13 clans got in V20 Lore of the Clans. However, I presume this is because more than half of the bloodlines are relatively recent (last 1000 years or so) and they are significantly smaller. Personally, I would have liked a bit more on each. There were nowhere near as many unique merits, flaws and disciplines as in Lore of the Clans. I also thought there could be just a bit more in the way of Necromantic powers given 3 of the bloodlines are necromancers (Ok, technically 2, but the Samedi do practice as well). If you are planning a Vampire Chronicle that you intend to run for a while, either focusing on a turbulent area over a few years, or leapfrogging characters from the Dark Ages to modern times, where there is the possibility and likelyhood of meeting rarer bloodlines, then it is a great, though not essential, resource. I feel it could have had more in the way of content, and perhaps be a little bit more definitive about clan origins, where the narrators have been vague. You can visit Drive Thru RPG to purchase V20 Lore of the Bloodlines. All the best, happy gaming.